30 years, 11 months, 23 days old age. Andre Russell will turn 31 on 29 April, 2019. Only 7 days, 13 minutes has left for his next birthday. Andre Russell has celebrated the total number of 30 birthdays till date. See the analysis by days count and bar graph. 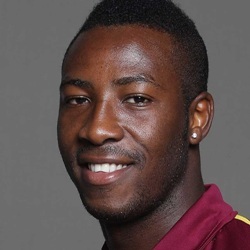 Andre Russell was born on 01-01-1970 in Jamaica. He is a Jamaican Cricket Player. By the time Andre Russell was little more than five years into international cricket, he was a two-time world champion. That both titles came in the T20 format defines the kind of cricketer he is. A batsman who hits the ball hard enough to make the inanimate thing scream for mercy, he functions primarily as a finisher. He generates even more pace with the ball in hand and when it is anywhere near him in the field, it doesn't matter at what pace it's travelling. His impact in international cricket was a bit sporadic until 2015, against South Africa in Port Elizabeth, when he provided a consolation victory for West Indies on a difficult tour by hitting 64 off 40 balls to chase down 263 with one wicket to spare. Those skills were evident in domestic T20 cricket though. He had a fine season with Worcestershire at the Friends Life t20 in England in July 2013 and a ground-breaking Caribbean Premier League a month later when his team Jamaica Tallawahs became champions. Russell's star shone brightest at the IPL 2015, when he was named Man of the Series, and the Big Bash League 2015-16 when he struck at 186.86 and picked up 16 wickets - joint-second best - from 10 matches. He won the CPL title with Tallawahs in 2013, the IPL title with Kolkata Knight Riders in 2014, the Bangladesh Premier League title with Comilla Victorians, the BBL title with Sydney Thunder and the Pakistan Super League title with Islamabad United in 2016. During the most successful period of his T20 career, however, a cloud hung over Russell because the Jamaica Anti-Doping Commission had charged him for not filing his whereabouts clause three times in 2015, an offense tantamount to one failed dope test. After hearings that went on over a year, Russell was found guilty of a whereabouts-clause violation and banned for one year by an independent doping panel in Jamaica. His ban period finally got over and he started playing in the domestic T-20 leagues. He had a great outing in the IPL 2019 and was their most valuable player in that season. He was born to Michael Russell and Sandra Davis. He is married to Jassym Lora since 2016. His parents wanted him to pursue higher studies but he convinced them to give him to 2 years to try his luck in cricket. In a match against India A, he took 4 wickets of 4 successive balls. He is one of the most sought after T-20 player and plays in 5 leagues every year. Besides his unique game, he is also known for his unique hairstyles. He was among the few players who were retained by their franchise before the mega IPL auctions in 2018.